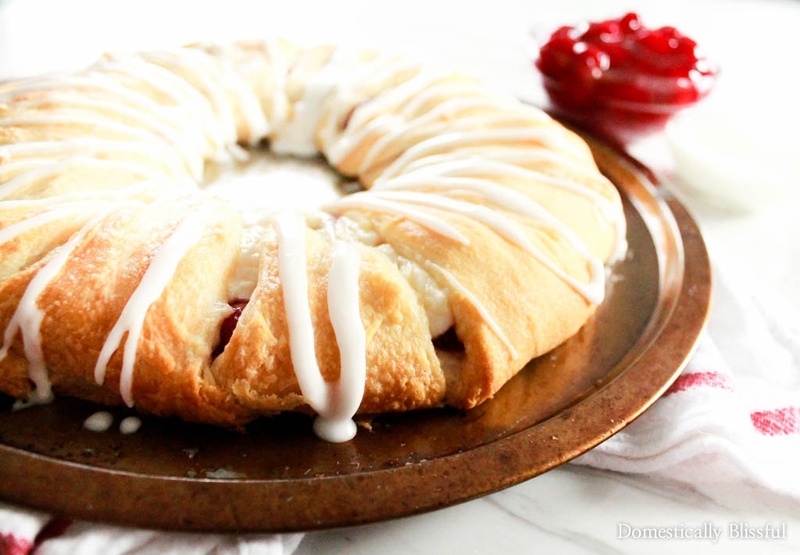 This Cherry Cheesecake Crescent Ring is delicious for breakfast, brunch, dessert, parties, holidays, or anytime you want a simple & quick treat! Only a few more days until Christmas! I have no idea where the year has gone & I am so not ready to let go of 2016! It’s been a crazy busy year, with a million & one changes in our lives, & it just feels like it went too quickly! I’m worried that if I blink my eyes it will be Christmas 2017! Even though this year has felt like is sped by, it also feels like a decade ago (rather than just 6 or 7 months) that we were living in Birmingham, still in school, & only dreaming of moving home, buying & renovating a house, & starting a new chapter of our lives. Can you believe how much has much has changed over the last year!? And since I was feeling nostalgic of 2016 & our first 4 Christmas’s & years of marriage together I decided to take a look back over this blog & how it has grown & changed over the last 3 years. And do you know what I discovered? There is a night & day difference between my first 25 posts & my most recent 25 posts. Also, I realized that the craziness of this year, the strange illnesses, job hunting, moving, gypsying, buying a house, moving, renovating a house, etc. led to me creating less than half as many posts in 2016 as I had my first 2 years of blogging. Not too surprising all things considered. And while we already have a really busy 2017 planned, let me tell you, I also have a calendar full of posts scheduled for the new year! My goal is to share 175 new posts of purposeful content with you next year, with 1/3rd of them being new recipes! This might be a little ambitious, all things considered, but I like a good challenge. But before the new year arrives I want to share one more recipe with you this year! This is one of those recipes that is basically perfect for any & every occasion. Not only is this Cherry Cheesecake Crescent Ring simple & delicious, but it’s quick, with a minimal amount of ingredients, & it’s easy on your budget too! While running about during this busy holiday season I popped into Save-A-Lot & was immediately greeted with holiday cheer by their associates. In a matter of minutes I had the items needed for this holiday dish, at a great low price, & was out the door without any stress. You can find the closest Save-A-Lot near you by clicking here so you too can save up to 40% every day to help manage your holiday budget. I couldn’t wait to get home & start baking. I love that this recipe takes less than 30 minutes to prep, bake, cool, & top. 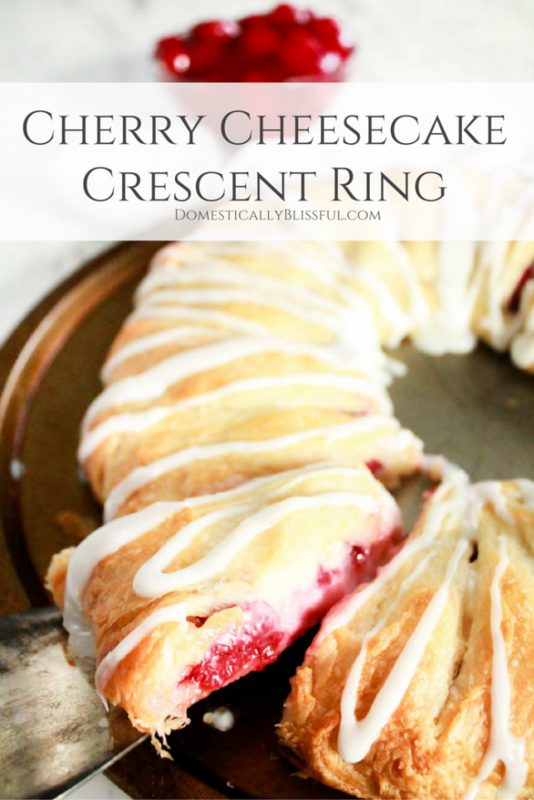 And another great thing about this Cherry Cheesecake Crescent Ring is that you can make it for breakfast, brunch, dessert, the holidays, a party, or just anytime you are craving finger food that is easy, delicious, & budget friendly. You can find more information on how to enter the first giveaway on Domestically Blissful’s Instagram by clicking here. To enter the second giveaway, simply click here to see everything that Save-A-Lot has to offer & then leave a comment below sharing how you plan to save money with your $25 Save-A-Lot gift card in the new year. And while you are there, don’t forget to sign up for the Save-A-Lot Smart Shopper Club. You’ll receive the latest specials delivered weekly to your inbox, tasty & affordable recipes, & helpful kitchen hacks & entertainment tips! Giveaway ends December 31, 2016, at 11:59 pm EST. Open to Legal Residents (18 years of age or older) of the US only. Prizes cannot be shipped to PO Boxes. The winner will be selected by Random.org and be notified by email. The winner will have 48 hours to respond before a new winner is selected at which point the winner’s first name will be announced on Domestically Blissful’s Instagram Stories. Each winner will receive one $25 Save-A-Lot gift card. I will contact you via email in order to receive your address for shipping purposes. I will make every effort to assist you in obtaining your prize. If there is an issue, please notify the blog you won a prize from within 30 days for assistance, after that we may be unable to assist you. The two $25 Save-A-Lot gift card provided for this giveaway was provided for by Save-A-Lot. The two $25 Save-A-Lot gift cards offered for the giveaway are free of charge, no purchase necessary. Facebook, Twitter, Instagram, Pinterest, and Google+ are in no way associated with this giveaway. I do not share or sell information and will use any information only for the purpose of contacting the winner. First, preheat your oven to 350 degrees Fahrenheit & spray a large pizza pan with oil. Open & unwrap both tubes of crescent rolls. Place the triangles on your greased pizza pan with the triangle points facing outward & the wide ends overlapping each other near the center to create a circle/ring. *1 Then press the overlapping pieces to create a seal. 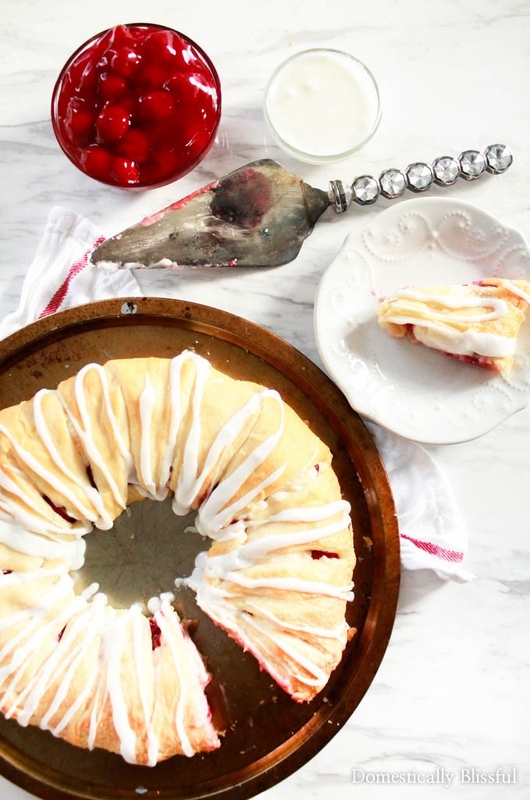 In a medium bowl, blend the softened cream cheese, sugar, & vanilla extra until smooth & creamy. Next, spoon the cherry pie filling onto the wide end of the crescent triangles. Then top the cherry pie filling with the blended cheesecake mixture. Fold the pointed triangle ends up & over the cherry cheesecake & then under the wide end of the crescent triangles to create a ring. 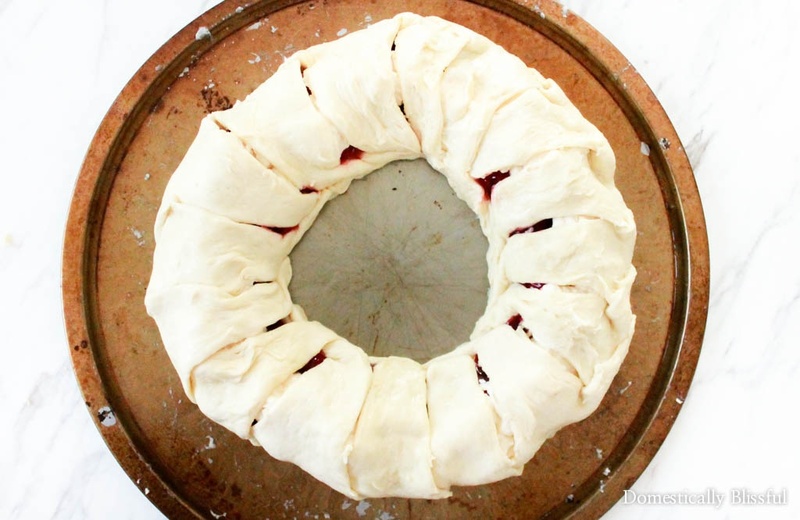 Bake for 20-25 minutes until the crescent ring is golden brown. 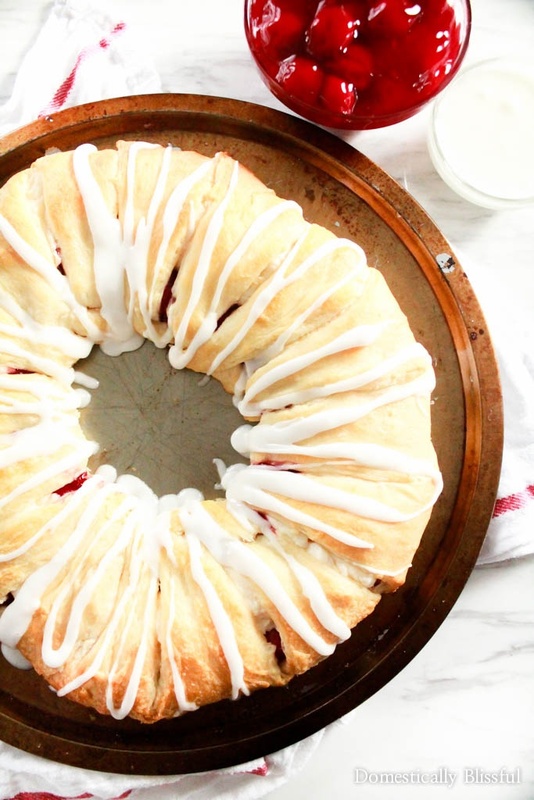 While your Cherry Cheesecake Crescent Ring bakes, mix the powdered sugar & milk together in a small bowl & set to the side. *1. The center hole should be 3-5 inches wide. 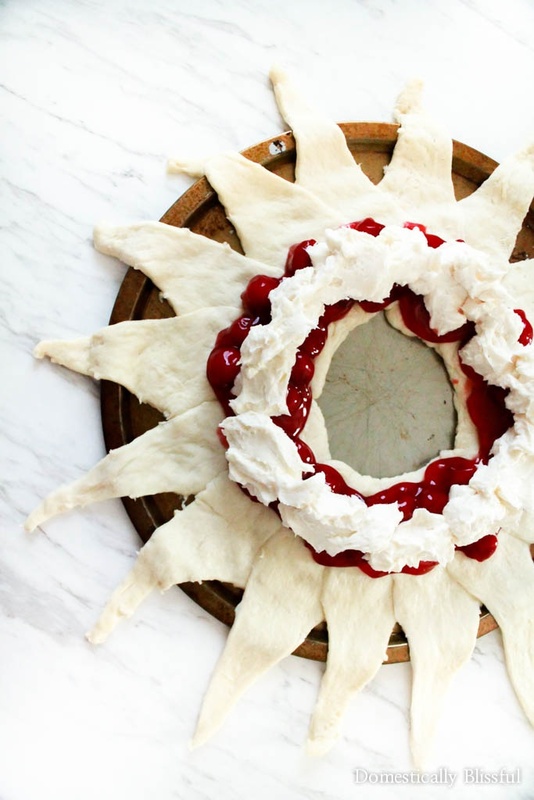 You can create a perfect circle by places a large cup or small bowl in the center & creating the ring of crescent roll dough triangles around it. 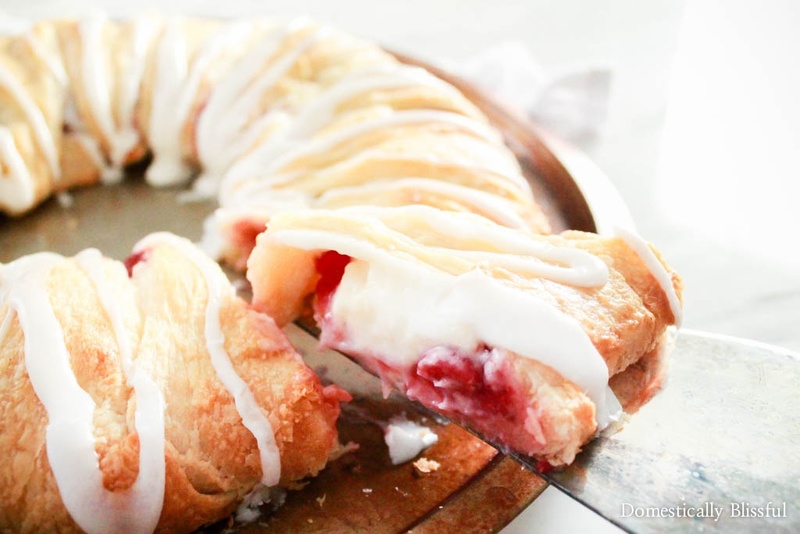 What is your favorite Crescent Ring filling? I plan to save money at Save-A-Lot by buying produce for my family there which is a lot cheaper but still good quality. I plan on saving money at Save-A-lot this year by shopping for my meats and fresh vegetables there. An appetizer that I always make for the holidays that i buy at savealot is sweet and sour Kielbasa. This cost me less than $5 to make. I plan to save money by shopping Save-A-Lot’s every day great prices!